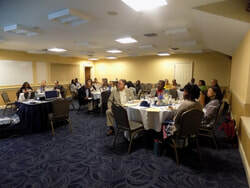 Old Dominion Medical Society holds a meeting and scientific session each year. The scientific program emphasizes clinically oriented lectures, panel discussions, luncheon seminars and industry-sponsored exhibits. The ODMS also sponsors extramural programs in cooperation with community hospitals and its local component societies. Upon completion of the annual program, attendees are awarded CME. ODMS offers opportunities for sponsorship at all our events. Please contact us for more information. Please check out our Upcoming Events for more information on our next meeting.